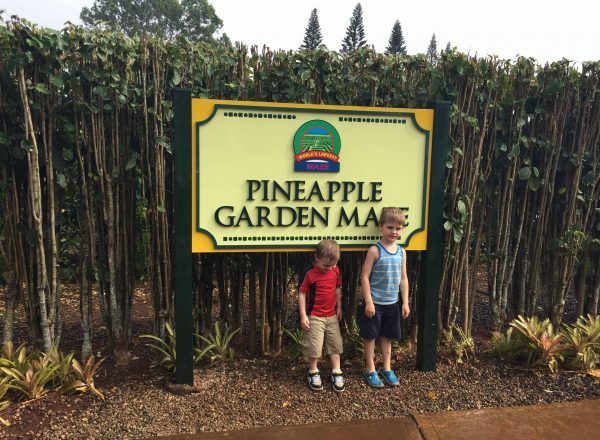 If you are looking for things to do in Oahu with toddlers, preschoolers and younger children, you are in the right place! Hawaii is one of my favourite places to vacation as a family with young children. 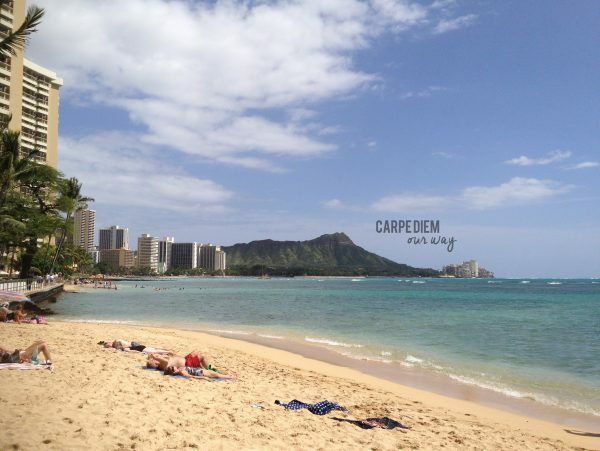 We even have a post dedicated to Why you should visit Oahu on your next family vacation! There are so many things that makes a vacation to Oahu with toddlers the perfect place to relax and enjoy your time together. Read on to see my 10 best things to do in Oahu with toddlers, babies and children. 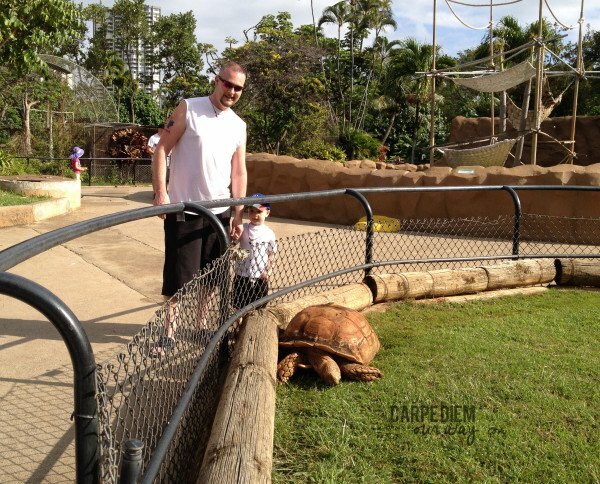 The Honolulu Zoo is one of my favorite things to do in Oahu with toddlers. With affordable entrance rates and plenty of shade, spend the morning at the zoo! With their affordable entrance rates and stroller friendly paths, the Honolulu Zoo is a great way to spend the day with your kids. It is one of my favorite toddler friendly activities in Hawaii. It is the perfect size to wander around for a few hours and you are able to see everything! Large trees afford lots of shaded areas around a grassy area and a playground for your little ones to play and enjoy a picnic without the sun beating down on them. I highly suggest asking about the Family Pass. For $45 you get admission for two adults and up to 4 children for a whole week. Depending on your child’s ages, this is a better deal than buying individual passes. And if your kids are like mine, they will be asking to go back the next morning and see the animals again! If you are a foodie, make sure you try the Kapahulu Burger while you are at the Zoo. It tastes amazing and I don’t think I have had anything quite like it! In the Early morning, Waikiki Beach is empty and it is a great one of the Oahu activities for kids before it gets hot and crowded! We visit early morning with a coffee and a snack and let the kids run around on the cool sand! 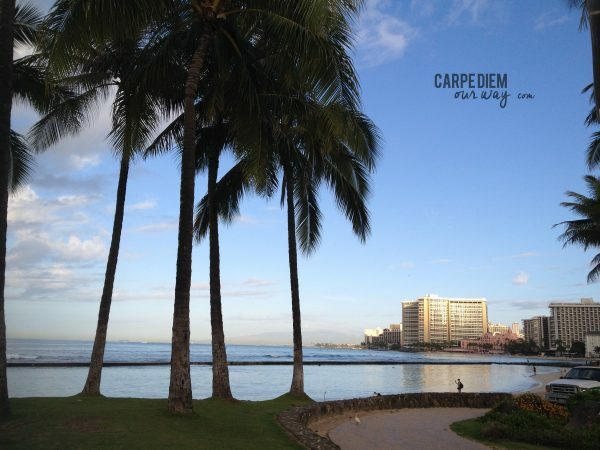 Early mornings at Waikiki beach are one of our favorite times when you are visiting Oahu with a Toddler. they will likely be up early and you might as well make the most of it! Build sandcastles as the sun comes up (make sure you grab a coffee for yourself!) and watch Waikiki come alive! We always share our crackers with the birds in Kapiolani Park and let the kids run around on the sand. It is a great way to spend the morning, or a whole day! Here are some things to pack for your day at the beach! Waikiki Beach at Sunrise when the beaches are empty. 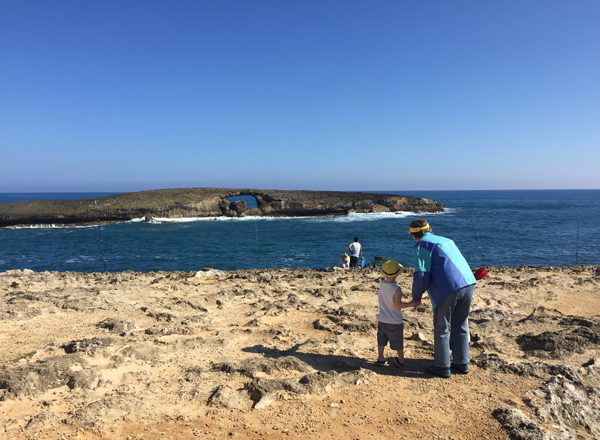 You can see why it is one of my favorite things to do in Oahu with toddlers! Plenty of SPACE to run around and a beautiful view for me! This is the Diamond Head side of Waikiki beach and the waters are nice and calm for young children! One of our many sand castles on Waikiki Beach! The boys would play and I can enjoy a Starbucks before the crowds arrive! 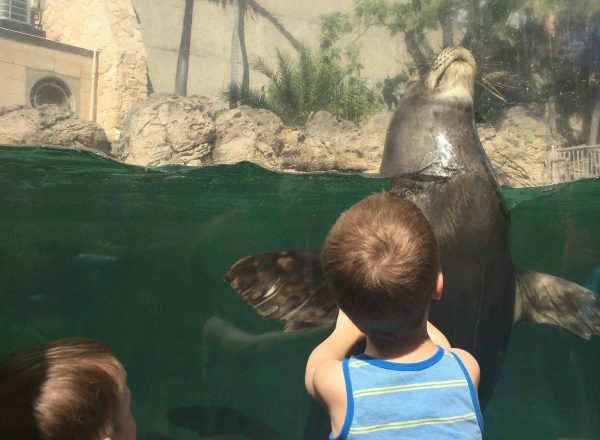 The Waikiki Aquarium is an Aquarium rich in history, and small enough for your toddler to wander around That makes it another one of the popular toddler friendly activities in Hawaii. 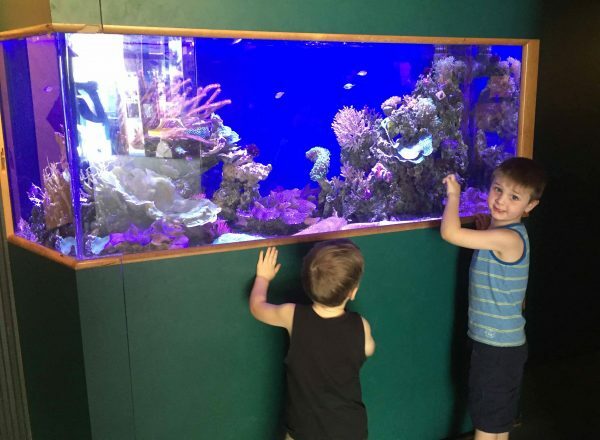 Our kids loved running from tank to tank to see what they could find and it is a great way to get out of the sun for a little while. It is stroller friendly but small enough for toddlers and preschoolers to run around without needing one. You can spend as little as an hour here. After dinner, put the kids in the stroller and walk along Kalakawa Ave as the sidewalks come to life with street performers. I suggest the stroller because the streets can get packed in the evenings and it can get tough for little ones to navigate! Waikiki has dozens of parades every year. Check online before you leave, or look for the no street parking signs. Those are usually a good indication of a parade date on Kalakaua! Stake out a spot early; bring a chair and a blanket! The beach is public property, however you sometimes need to find a way to “access it” but once you do, (via the many beachside parks around the island,) spend some time exploring the beautiful shores. Oahu is a great vacation with kids because the beauty is all over. They do not need to be in strollers while you explore historical sites, they can run around and explore as you wander the beach or enjoy some time in the sun! You will often find beaches with no one on them at all! You will probably be told you need to see Hanauma Bay, but unless your little ones are super comfortable in the water snorkelling, it is something better left for older kids. 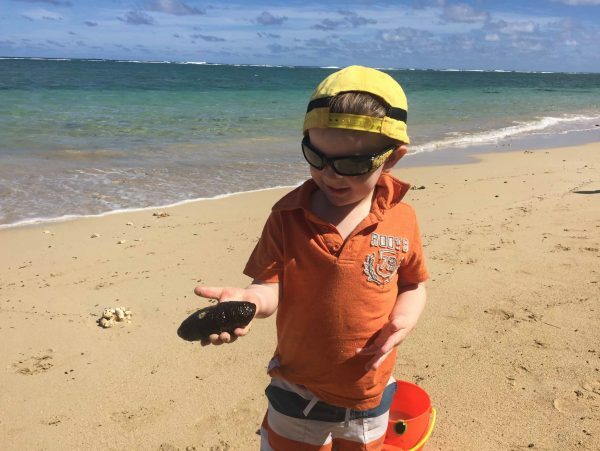 You can see beautiful fish and turtles right off the shores of any beaches in Hawaii and your little ones can play on the shore. If you want to go to Hanauma Bay, you need to get an early start ( the parking lot opens at 6am), as the parking lot fill fast. It is closed on Tuesdays. Ensure you have Reef Safe Sunscreenfor your visit to Hawaii to protect the marine life. It is possible to catch a free Hula performance while in Hawaii with your children. If you are at Ala Moana Centre, they have performances daily. I highly suggest checking out the Polynesian Cultural Centre for the full experience! If you are planning on doing a lot on Oahu, I suggest you try to GO OAHU Card, it offers admission to 30 attractions including the Polynesian Cultural Centre and MUCH more. You can check it out here. This one can be hit and miss depending on your own child. But if your child is a night-owl and not afraid of loud noises, consider watching the Friday night fireworks around 8pm at the Hilton Hawaiian Village Hotel. Hawaiian cuisine is a fusion of Asian, North American, Portuguese and Native Hawaiian foods. Just go into any local grocery store and you will find many different foods. 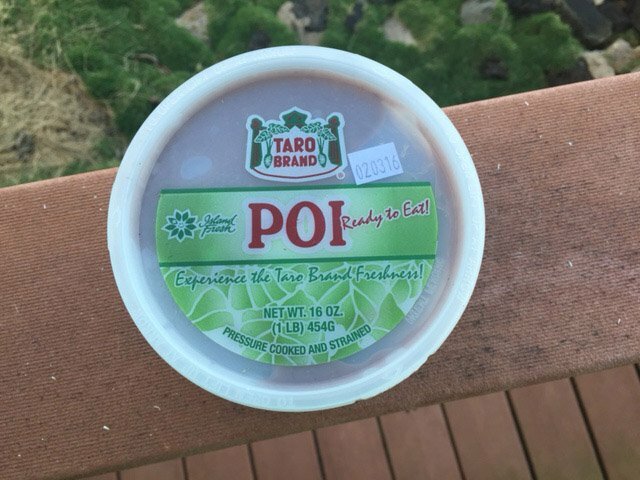 Grab some ready-made Poi (Taro) for the kids to try. Its taste is bland, consider adding milk and sugar and serve it like oatmeal. 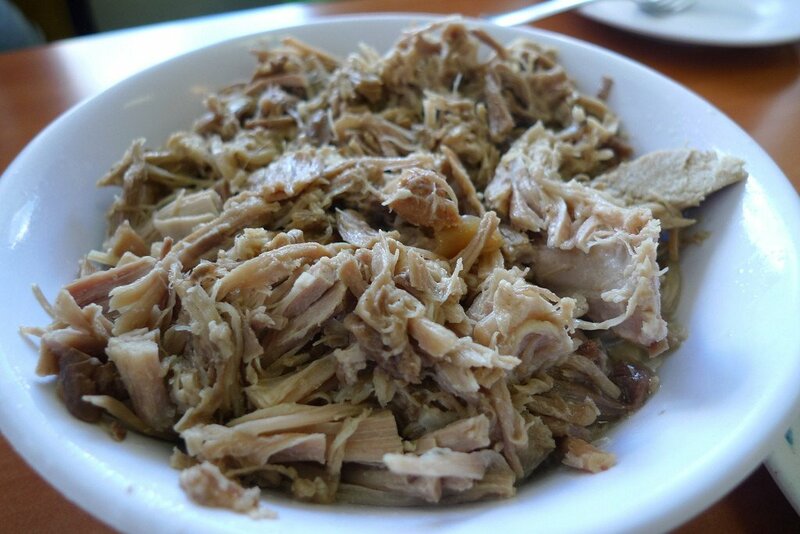 Click here for some Hawaiian Foods we think you should try! 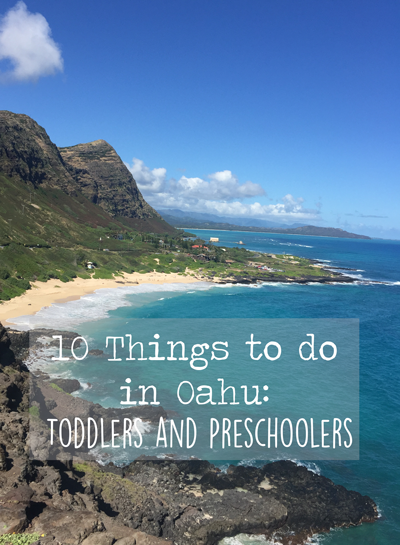 This is arguably a vacation in itself but due to its popularity I thought it should be included in the best things to do in Oahu with Toddlers. 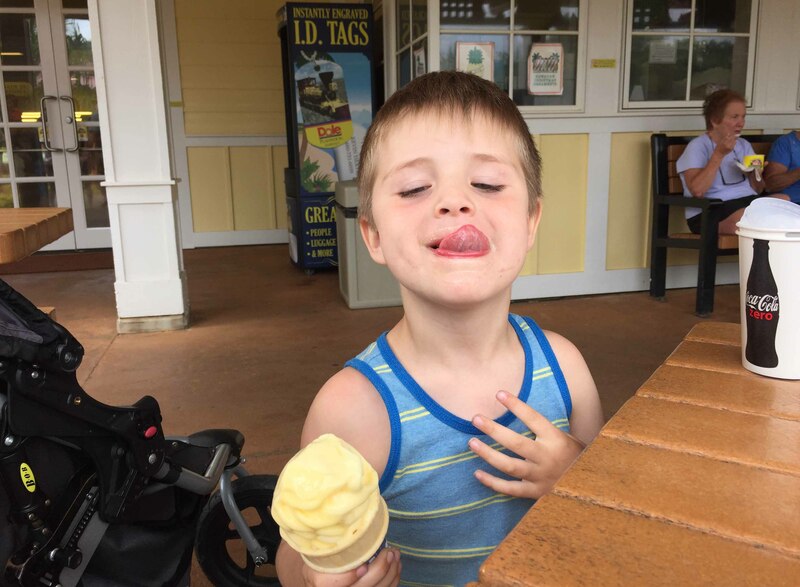 Disney knows how to do everything right and with the wealth of kid-friendly activities at Aulani from the water parks to the entertainment from “Auntie” and “Uncle” there is tons to keep the littlest and the oldest members of the family busy! While many of these are suited to older children, I wanted to add in Kualoa Ranch, as it is more than just horseback riding! You can check out their activities here and there might be something that works with you and your little ones! If you want amazing views of the Diamond Head crater and have kids that can hike uphill, consider a few hours to hike to the top of Diamond Head! It offers beautiful views of Waikiki Beach and the inside of the massive volcanic crater! This also gets busy and has a lot of switchbacks, but I took my 7 and 5 year old up it the last time we visited Hawaii and they have no problems getting to the top! If you have an adventurous preschooler or a toddler who will still go in a hiking pack, this hike is totally doable! Most adults want to visit Pearl Harbour and it is worth a visit for sure! If you want more info about visiting Pearl Harbour, this post has a ton of info! JJ Cole Outdoor Blanket – I love that this folds bigger than the beach mats and is comfortable! It is always in my beach bag! If you are bringing car seats and do not think you have room in your suitecase for this, you can always throw it into the car-seat bag! Puddle Jumper Swim Vest – These are getting super popular and give moms and dads some peace of mind with those brave toddlers! While the waves are quite calm on the beach for the most part, some of the waves that come in can knock little ones over! Stroller Fan – when little ones need to nap at the beach, I like to be able to cool them off with this fan. If the thought of bringing a car seat and stroller and everything you need for a baby to your condo-style hotel sounds like a huge pain, do not worry, there are baby gear rental places that deliver right to your hotel or apartment. 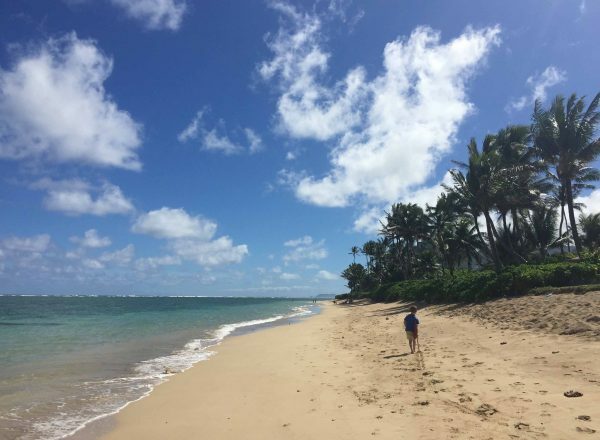 While I have not used this service myself, Nannies Hawaii has great reviews if you would like to do some non-toddler friendly things like hiking or snorkelling or would like to enjoy an evening without the kids! This Diamond Head HIke looks like something I would check out if I had booked a babysitter! Need more ideas? Check out some ideas from Barbara at Jet-Settera here! How is that for 10+ things to do in Hawaii with toddlers? If you have more suggestions I would love to hear them! We took our entire family (4 kids) to Hawaii years ago. At the time, the youngest was about 6, though. We visited most of the places you mentioned here, plus Hanauma Bay and the Polynesian Cultural Center. Loved them all! 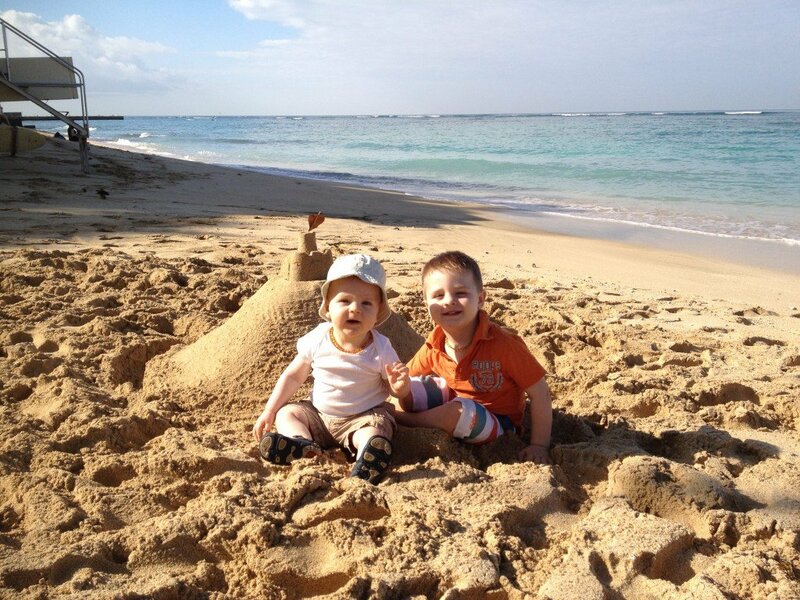 Although it is more challenging to travel with toddlers, how can you miss in Hawaii?! Seems like there’s so much to do for the little ones. The beach itself is already a great playground for them! What fun. Great places for kids to explore. Would love to watch to see a Luahu though. Nice list for kids and adults alike. Pineapple plantation is a great place! Fun choices I remember visiting the pineapple plantations in Hawaii when I was a kid. The beaches look so lovely, I’d love to revisit. A great list. I loved the Dole Plantation and I was 17 when I first went. Looks like I’ll need to go back. I haven’t been to Oahu yet, but this is a great list of things to do even if you don’t have kids. I really love visiting zoos and aquariums, so I know I’d definitely being visiting those. And of course, laying out on the beach! I would love all of these and I am 25. These seem very kid friendly but all sound like a lot of fun. I would love to see the Dole plantaion. I have to agree with Jennifer… I would love all of these too and I’m 41! I’ve been dying to go to the dole plantation… that and the coffee in Hawaii is my heaven! Ahhh, Dole Whip is my FAVORITE! You just made me crave some with that photo, lol! Great list of things to do in Oahu–we don’t have kids, but I can see my nieces and nephews enjoying everything on this list. 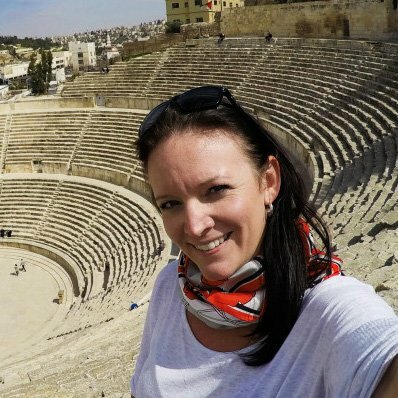 We would love to do most of it too, especially exploring the beaches and trying new foods! Great ideas for kids but as a travelling couple we’d totally do them all anyway. A deserted beach, fireworks and pineapple ice cream would definitely make my hit list for a good day in Oahu. How exciting that you get to go visit Oahu again, and for TWO weeks this time?! You ll have even more time to explore and without feeling quite so rushed. I don’t have kids, but I’ve done all of those things! I guess that shows that the adults will enjoy the vacation too. It’s not just geared to kids. You have such beautiful children, Lindsay! It’s so inspiring what you guys do! You are definitely creating a rather alternative but nevertheless beautiful way of raising your children! I’ve always believed that a unique childhood experience will resonate well up unto adulthood. More power to your family! You guys are getting me excited for travel when I have my own children someday! Great post Lindsay! I think i’d like to do most of them anyway despite not being a pre-schooler!! I’d definitely visit Honolulu Zoo and I would love to find an empty beach – I can’t believe the idea of an empty beach!! Sounds like a dream to me! thanks Chelsea! I hope you enjoy it as much as we do! Your kids are ADORABLE! These are supremely great tips that I definitely need to hold on to. I’m not a kid but a luau, fireworks and parade are all things I can get behind. Also, your list sounds a lot like Disneyland which of course I am all about.